The 2013 FIBA U19 World Championship for Women is open to all players born on and after 1st January 1994 and is hosted by the Lithuanian Basketball Federation. 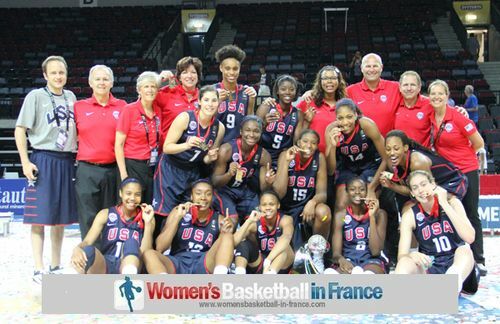 France are participating in this competition for the fifth time and the 12 players selected played for clubs either in the LFB (Ligue Féminine de Basketball) or LF2 (Ligue Féminine 2) during the 2012-2013 season. Valériane Ayayi (1994, Basket Landes, LFB), Marième Badiane (1994, Roche Vendée, LF2), Clarince Djaldi Tabdi (1995, CFBB, LF2), Olivia Epoupa (1994, Basket Landes, LFB), Elise Fagne (1994, CFBB, LF2), Aby Gaye (1995, CFBB, LF2), Pauline Lithard (1994, Reims BF, LF2), Eva Marsac (1994, Limoges ABC, LF2), Marie-Eve Paget (1994, Cavigal Nice, LF2), Awa Sissoko (1994, Illkirch-Graffenstaden, LF2), Mamignan Toure (1994, Arras, LFB) and Lidija Turcinovic (1994, Lattes Montpellier, LFB). The 2013 World Championship competition format has not changed from the previous edition. The tournament starts with the Preliminary Round in which the 16 teams are divided into four groups of four teams. The first three teams from each group qualify for the Eighth Final Round while the bottom teams participate in the 13th - 16th place classification. The eight teams that qualify from the Eighth Final Round qualify for the quarter-finals (knock-out stage). All teams that are eliminated from the championship race continue to play in the classification round. 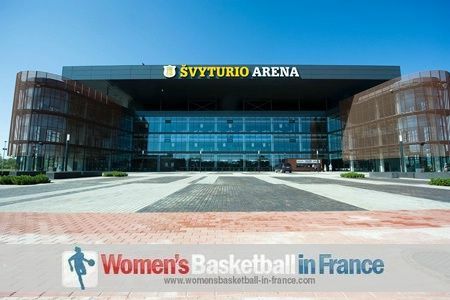 The competition runs from 18 July until 28 July 2013 while womensbasketball-in-france covers this tournament from 22 July 2013. All the games from Group A and Group B and Group E of the Eighth Final Round are played in Klaipeda. For Group C and Group D and Group F of the Eighth Final Round the games are played in Panevezys. All the classification games, quarter-finals, semi-finals and finals are also played in Klaipeda.